One bull can breed more cows if he is fed grain daily. To keep friends out of his feed a water squirt bottle will quietly keep the cows from sharing. Some are persistent, so take a full bottle. A harmless squirt in the face makes a peaceful meal time. 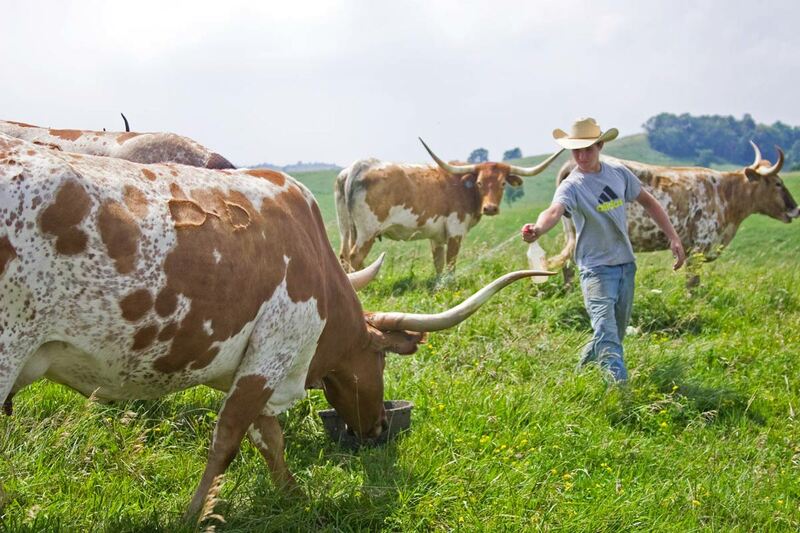 As this article is being read, thousands of Texas Longhorns are growing horn, some very fast and some -- slow. This speed of growth can be increased or decreased in many ways by management. Some management methods are expensive and some are very economical. Pick and choose the ones that fit. Not only in pro sports, but in ranching, there are often simple professional ideas, identified by experience, that work to tip the scales to a major victory or, a dead loss. It is obvious that mating of the largest horned genetics provides a distinct advantage in horn growth, but some management will reduce the fast growth and other management will increase the slower growth. For this "management" article we will pass up the chat about what are the best genetics and go directly to the how-to-do-it-all-better part. A special part of managing for horn is to avoid horn breakage. The main horn tip loss is from parallel vertical corral panels, alleys and chutes. Cattle move horizontally. When vertical pipes are two to four inches apart and parallel, it is a horn trap. When a cow is moving forward and a horn slips into a "parallel trap" something snaps. Corrals can be designed with all horizontal parallels for large horned cattle and it works equally well for non horned cattle. There should be NO parallel vertical "traps" in any handling squeeze chute. Although 99% of all corral panel and chute systems have numerous traps, that don't make it correct management for serious producers. This is only helpful for producers in wet and high rainfall areas. Abundant rain on horns has a similar effect to chapped hands. Use grease for hands and also for horns. To prevent a flaking and loss of horn, when young stock are being vaccinated or worked through chutes, generously rub some cheap thick grease on the horns, like bacon grease. This can be done with a paint mitt. The generous rubbing from the hair line to the tip creates a protective seal and prevents deterioration of horn -- not a lot, but some. A can of the same bacon grease, using the same mitt can be rubbed on a fresh brand to reduce dryness and help make a smoother, faster healing brand. Be generous, bacon grease is cheap. Education may be the most lacking thing in management. A $50,000 critter that is spoiled or silly due to lack of careful handling is very bad management. A lot of things can be done to increase the security of a bovine investment by a planned education program. 1) Halter training during the younger years is a good way to gentle a valuable animal. The human touch, leading, brushing, and baths are all simple ways to educate. 2) Trailer training can be done by driving cattle into a trailer with a wide open front escape door. If cattle are trained to go in the back and walk out the front three or four times they will load easy for ever. 3) Chute training can be done by moving them through corrals, into narrow alleys and into a chute spread wide open. As they are trained to walk safely through an open chute, they walk slower, without hesitation, and become easier to confine when needed. 4) Auction ring training is a management tool for a valuable critter. Take a pan of grain into the sale ring the day before the sale and allow the consigned animal to eat feed in the ring. Walk around the critter and get them used to the ring atmosphere. Many gentle cattle are startled by the loud noise, the people, the lights of a live auction and go immediately into an unusual ballistic behavior unlike their true personality. A twenty minute "walk around" and snack in the sale ring may be the special management tool needed to make a valuable cow show and sell at their educated best. Vaccinations are pretty basic, however the failure to have a readable official calf hood vaccination (OCV) tattoo will eliminate cattle from shipment to several states. Although there are no laws by the federal government that people have to OCV vaccinate, there are state laws that no female can enter their state without a readable OCV. This has been a problem at nearly every sale. A good manager will faithfully OCV every heifer during the proper months of their early life. Contact a good large animal vet about recommended vaccinations. Every area has different problems. The cost of vaccinations is a pinch of the value of outstanding cattle. This is basic management, without excuse. Insects must be dealt with. There are oil rubs, pour-ons, and vapor tags to keep the biting insects off prized cattle. A bull with flies will dig his horns in the ground, paw and throw dirt on his back and eventually wear off horn tips. Managing biting insects will help reduce horn damage. Anywhere cattle are confined is a horn concern area. Trailers are a place of "traps." Divide gates can be designed to manage horned cattle safely. Here are three tips: 1) always have the divide gate about 10 to 14 inches above the trailer floor. If a critter lays down, they can easily get their legs out from under a gate. Low gates can be a source of leg injury. 2) design the top side of the divide gate tall enough that no animal can even think of going over the top. 3) Make the center of the gate solid so bulls will not spar or even see one another during a trip. Most trailers are built for a wide range of uses. Although cattle people may buy a trailer, a pig or goat dealer may buy the same style trailer. Gates have to be low enough a pig can't get under. It may be important to re-weld the divide gate and raise it for cattle. The oval punch type sides on some aluminum trailers will trap horns in a serious way, especially when cattle are loaded tight. Punch sides are not recommended for Longhorns. Minerals are a major factor in healthy cattle development. Many arguments have ended in a dead-heat about necessary vitamins and minerals. Some theory is that horn is protein and a very high protein diet is the best. That is partly true. The outer horn shell is over 90% protein, but the inner core, the bone is over 90% calcium. Neither will excel without a balance of each. In fact no one mineral grows horn, but a total balance of minerals either provided by the nutrition available from grazing, or supplemental trace minerals provided in enough volume to assure the correct balance. The old timers always put out salt blocks and the cattle liked them, however when reading the ingredients on salt blocks whether it is labeled as a mineral, sulfur, etc., the real content is over 98% salt. Salt is not a corrective source of mineral. Don't be fooled. Well managed pastures may need added lime or fertilizer to get the good nutritious balance needed. Most ranches have too many bulls. To manage for horn, use the best bull or bulls for the most calves, and don't use the bottom end bulls at all. 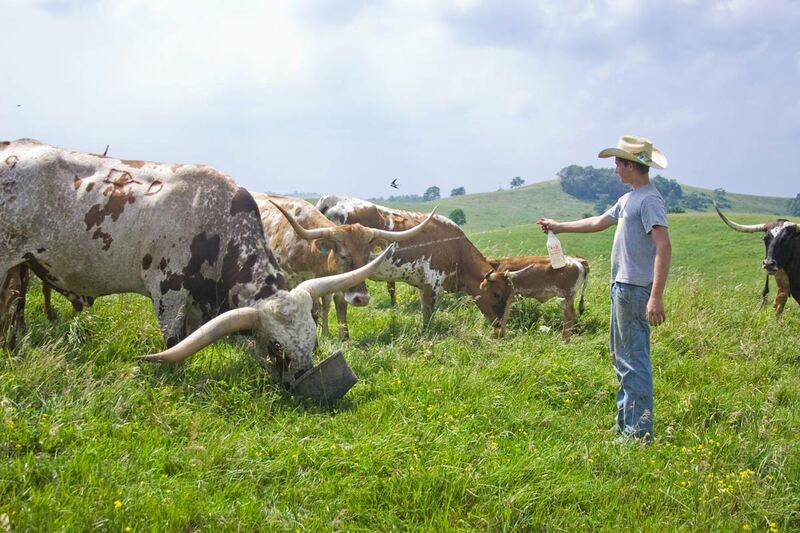 A healthy mature Texas Longhorn bull can breed 60 to 150 cows per year, unlike other less athletic breeds. Forget what the colleges say about calving in a 45 day or 60 day time period and using one bull per 20 cows. That is for breeds that have major calving problems that require constant surveillance. If the best bull needs more time to get them all bred, do it. It is best to have more calves by the best bull even if calving is spread throughout the whole year. If the bull can't retain a healthy weight, feed him grain every day. (Illustration) Slowly build him up to two or three gallons of grain per day fed in his pasture. Keep the cows away so he can eat it all. The extra nutrition will give him more stamina and increase fertility. One well managed bull, well cared for will do the job of several bulls. A one bull program may be economical, but has limitations. Seldom ever will one bull work well with every cow. When it is obvious the one good bull hasn't worked well on certain cows, separate those cows from him and AI to a bull known to correct the genetic issues. Some sell all heifers from a good bull so he will not be breeding his daughters. Keep the best heifers and AI them to a superior unrelated bull. Don't feed any more bulls than absolutely necessary. Bulls will breed more cows in less time if they have smaller pastures. Divide large pastures into smaller ones to limit the time required by a bull to manage his herd. Rotate the use of pastures. Keep electric fences between bulls. Electricity trains bulls to stay away from fences, not to rub their horns on the barb wire and not to spar through the fence with other bulls. Electric will help train a bull so he doesn't get bad habits and will have many trouble free breeding seasons. Good management is using the best specimens in the herd for herd improvement. Some sell the "goose that lays the golden egg" and that ends the source of outstanding progeny. To be sure of the best use of the best genetics, keep that great cow until she produces a great son and at least three daughters, then sell her if you need the money. That will guarantee the special blood in the herd will stay and contribute for herd improvement many years to come. Keep good management records to know what happened, how it happened and how to make successful things happen again and again.